A cartoon about aesthetics, taste, beauty, design, cultural convention, artistic taste. An illustration or artwork about pareidolia – illusion of seeing faces where they don’t exist. A cartoon showing a Sunday school teacher telling her pupils that you can see the face of God when you look at a flower. One of the children is imagining the face of a pansy as the face of God. Pansies do have faces after all. Seeing faces in things is known as pareidolia. This cartoon was drawn during a prolonged period of very overcast summer weather, when the sun didn’t shine for a long period of time. As well as being a straightforward cartoon about garden design and the pitfalls of garden design, this cartoon is a metaphor for the way that people often can’t tell what they are doing wrong (even though it may be staring them in the face). Cartoon showing a hanging basket in a garden, suspended from a scale model of a construction crane or tower crane. The model of the crane in the garden is meant to illustrate the fact that garden features and garden decorations need not be limited to concrete or resin copies of classical statues. The structure of the crane here is meant to suggest modern sculpture of constructivist sculpture to some extent, as well as simple garden frameworks and trellises for plants to climb on. Cartoon of a gardener looking at some crocuses in his lawn. The crocuses are flopping over or keeling over and wilting after a very short period of flowering. The gardener is complaining that no sooner do crocuses come into flower than they then wilt and die. This is a cartoon about optimism and pessimism, glass half full, glass half empty, looking on the bright side, plants flowering in succession. It’s also about life moving on, change. 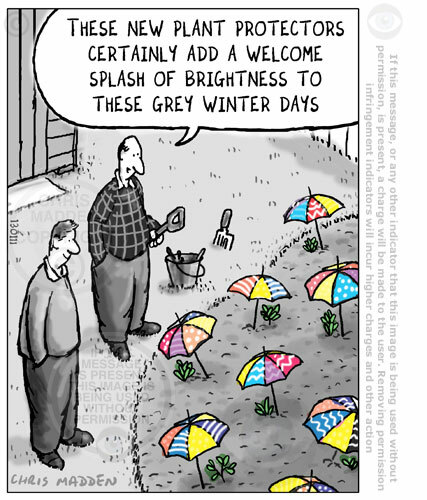 The joke in this cartoon centres on the fact that the man who is laying out the garden has no aesthetic appreciation of design or colour in the garden, and is basing his design on categorisation of the plants by name. This is his idea of creating order and control in the garden, and this is what he is happy with. An important aspect of this cartoon is that the man is arranging his plants in alphabetical order – not in order based on species (which may be a method of planting that places order over aesthetics, but at least such a planting scheme has a rationality to it, whereas planting in alphabetical order is to some extent random and thus is an illusory form of rationale). Garden cartoons – a weed’s a weed. What’s the definition of a weed? A cartoon about the definition of weeds, wild flowers in gardens, natural gardening, wild flower gardening, encouraging wildlife and nature in the garden. A humorous illustration showing a flower bed with a very tall specimen in it. The flowers are ones that you really need to be able to get close to. Vertical gardening comic illustration – showing an outdoor spiral staircase in a very small garden, with flowers planted in hanging baskets up the staircase. How to make a small garden seem bigger. I may do a different version of this cartoon, set in a particular town in the UK. I’ll call the cartoon “The hanging gardens of Basildon”. Surely that must be the name of garden centre in Basildon. If it isn’t, it should be. This type of gardening is now known as vertical gardening. Versions of it can be found on walls on the sides of city buildings, both outdoors and indoors. Gardening humor – is there room for one more plant in a garden that’s full to bursting? `humorous illustration showing gardeners in a very well stocked garden. One of the gardeners has just returned from the garden centre with yet another plant. She’s asking optimistically whether there’s room for another plant in the densely planted garden. A humorous illustration about gardening competitions, flower shows, plant breeding, daffodils, children in gardens and prize winning blooms. A comic illustration showing a gardener laying out a flower bed in the shape of a map of the world. The joke is partly that the gardener hasn’t been able to source any plants from Antarctica. This is because the Antarctic is the only landmass on earth with no vegetation to speak of, apart from a few species that hang on in the margins. There are only two species of flowering plants in Antarctica, the Antarctic hair grass (Deschampsia antarctica) and the Antarctic pearlwort (Colobanthus quitensis), which grow on the South Orkney Islands, the South Shetland Islands and along the western Antarctic Peninsula (The source of this information is the British Antarctic Survey). A cartoon showing a gardener looking at a very small flower through a magnifying lens. A joke about a gardener using a concrete mixer as a garden planter or plant pot. The joke in the cartoon is that the concrete mixer has just been used in order to concrete over the garden, leaving nowhere to plant flowers. A cartoon about gardening, garden design, patios, patio gardening, paving over the garden. Novice gardener cartoon. What’s this flower? The joke is that the flower is a daffodil – a type of garden plant that is so common and popular that almost everyone knows by name. Sometimes the plant labels show the plant as more beautiful than the plant will ever be (at least in most gardens). A cartoon about selling flowering plants, blossoms and blooms by showing the flowers on the plant name labels. Sometimes the flowers or plants on the labels look so much better than the actual specimen that they are almost against the trades description act. A cartoon showing a man noticing that the flowers in the garden always seem to come into bloom just when he’s going away on holiday. A cartoon about garden flowers, the importance of growing plants that come into blossom at the right time. 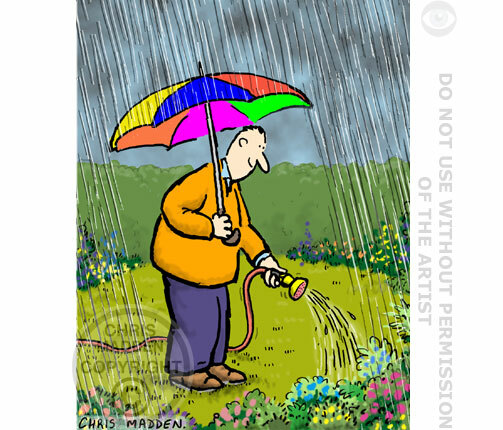 Cartoon showing a gardener watering the flowerbed with a watering can – while it’s raining. A hanging basket that was placed in a tree in the spring before the leaves came out on the trees, with the flowers in the basket obscured by the tree’s leaves in the summer. A man admiring a flower close up, and observing the insects and creepy-crawlies that live on it.